It has been nearly 50 years since Isabel Alonso’s parents, Dr. Reinaldo Alonso and Maria I. Alonso, founded Champagnat Catholic School in Miami, Fla., located in a community built around the immigrants that came to the area to start a better life for their families. Over the years, the school has grown and evolved to meet the unique needs of the children living in the multi-cultural South Florida communities. 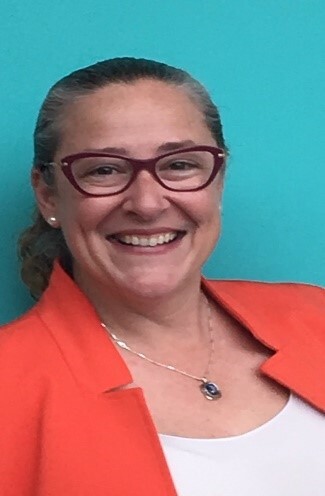 However, Isabel, who now leads the school, has remained dedicated to continuing the school’s original purpose to serve the diverse community – especially the economically disadvantaged and immigrant families in need of educational options for their children. As Cuban immigrants themselves, and with a history in leading educational institutions in Cuba, Dr. and Mrs. Alonso started Champagnat Catholic School at a time when there was a shortage of schools to serve the many families migrating to South Florida from Cuba and Central and South America. The school started with 123 students and over the years, as its popularity and a sheer need for educational choices for the families in the area grew, the school eventually added a second location in Hialeah, Fla. Today Champagnat serves students in sixth through 12th grade, and has had more than 5,000 graduates and counting. One of those graduates, of course, was Isabel Alonso and she remained involved in the school even while pursuing her own higher education. When she was just a sophomore in college, she started the athletics program at Champagnat, something the school had not been able to offer previously. She helped build the program from the ground up to eventually become the competitive athletic program the school offers today, which includes state championships for their basketball and football teams, as well as successful baseball and track teams, among others. But her reason behind engaging the school in a successful sports program was beyond just the athleticism and awards. After successfully establishing Champagnat’s athletics program, Isabel eventually left to pursue her own degree in hospitality management and spent several years opening restaurants and working long hours that left her feeling exhausted and not quite fulfilled. It was during one visit home with her parents that she felt an unshakeable calling to help Champagnat and the surrounding community as a whole. Soon after, she quit her job and returned to South Florida to once again help her parents run the school that they had spent so many years of their life building. Not long after she returned, however, her mother was diagnosed with cancer, and Isabel realized that perhaps that unshakeable feeling she had months earlier is what led her to be in the right place and the right time – not only to be with her family during a great time of need, but also to help keep the school afloat and continue her parents mission and life’s work. Sadly, Isabel’s mother and Champagnat’s co-founder, Maria Alonso, passed away in 2010. However, Isabel has kept her promise of continuing on her parents’ good work through Champagnat. The school fulfills a great need in the community, where all too often at-risk youth are in danger of falling through the cracks. 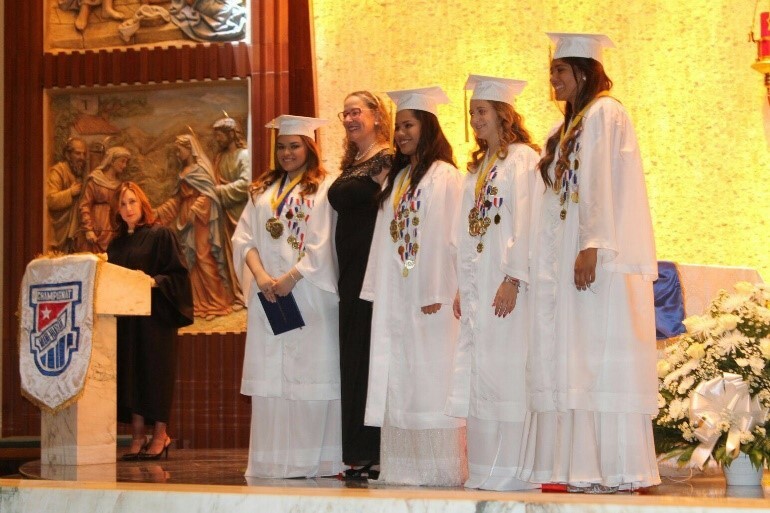 Champagnat serves as another option for families, especially those with limited financial resources, by providing their children with a safe learning environment and a quality education designed to prepare them for future success. More than 90 percent of the students at Champagnat are either on the Florida Tax Credit Scholarship program for low-income families (like those provided by the AAA Scholarship Foundation), or the McKay Scholarship for students with disabilities. The diverse student body of the school has fluctuated over the years depending on the influx of immigrants moving into the community. Currently, about 30 percent of the students are African-American, and about 70 percent are Hispanic. Isabel and her team of dedicated teachers and staff work to create a family-like atmosphere at the school, providing students with individualized attention and a quality college preparatory education. Isabel has seen countless success stories at her school, such as the timid teen that came to them from Columbia, unable to speak English and with a tremendous fear of attending school in a new country. She overcame her struggles and is now attending college. Or the young man that took advantage of Champagnat’s academic and athletic programs as a means to gain access to higher education at the University of Miami and eventually a career in professional basketball overseas. In explaining why families need options for their children’s education, Isabel sums it up pretty simply. The AAA Scholarship Foundation awards scholarships solely to qualifying low-income, disabled and/or displaced students. The typical AAA Scholarship student is an ethnic minority living with a struggling single parent/caregiver in a high crime community. More than 85 percent of AAA scholarships are distributed to children at or below 185 percent of poverty. Many children are either below grade level, failing at their previous school or both when they receive a scholarship. Parents, who find their children in these circumstances and care about their future, look for viable options. They seek an atmosphere that challenges their child and will reverse inadequate learning, social patterns, and the potential lifelong negative impact. They wish to change their child’s learning environment, acquaintances, and the unfortunate predictable outcomes associated with school failure. AAA Scholarships are funded in Alabama, Arizona, Florida, Georgia, Nevada, and Pennsylvania by corporations that redirect a portion of their state tax liability to the AAA Scholarship Foundation in exchange for a tax credit (dollar-for-dollar in Alabama, Arizona, Florida, Georgia, and Nevada, and up to 90 percent in Pennsylvania). The AAA Scholarship Foundation is one of the only approved Scholarship 501(c)(3) Nonprofit Organizations exclusively serving qualifying low-income, disabled and/or displaced students through these Scholarship Tax Credit programs. AAA Scholarship Foundation provides your company with the convenience and efficiency of a single-solution for participating in multiple state tax credit scholarship programs. For more information, or to learn how your corporation can participate in the program, visit www.AAAScholarships.org, or contact Kerri Vaughan at kerri@aaascholarships.org or (888) 707-2465 ext. 730. For a pdf of this school spotlight, click here.